‘There is nothing but good to be said of aunts,’ wrote the Irish essayist Robert Lynd. 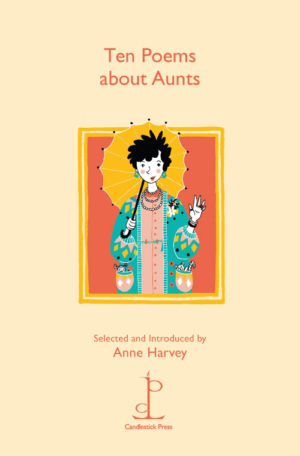 And indeed, the poems in this pamphlet, introduced and selected by anthologist Anne Harvey, remind us of the love and esteem that aunts can inspire. True, auntly literary history boasts the odd gorgon – think Lady Catherine de Bourgh in Jane Austen’s Pride and Prejudice – but for the most part, aunts are seen as benign, even essential, participants in the lives of their nieces and nephews. These moving and entertaining poems are about aunts who work hard, play hard, occasionally prop up the bar or fall out of trees, but are always to hand to show their nieces and nephews solidarity or to mop up tears.